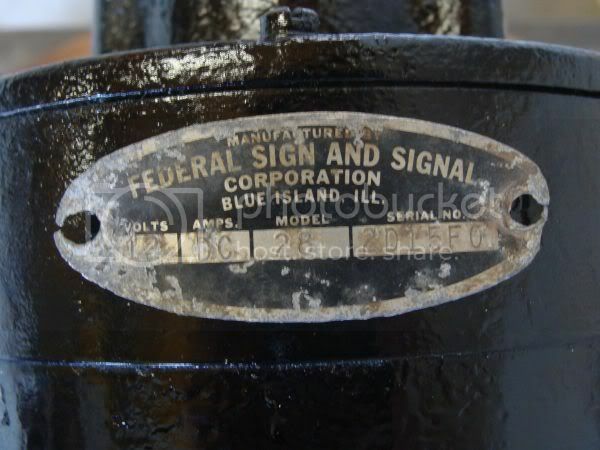 Federal 28 Siren ? 's - Friends of the Professional Car Society - Official Website of the Professional Car Society, Inc. I'd like to tap, once again into the wealth of knowledge here. 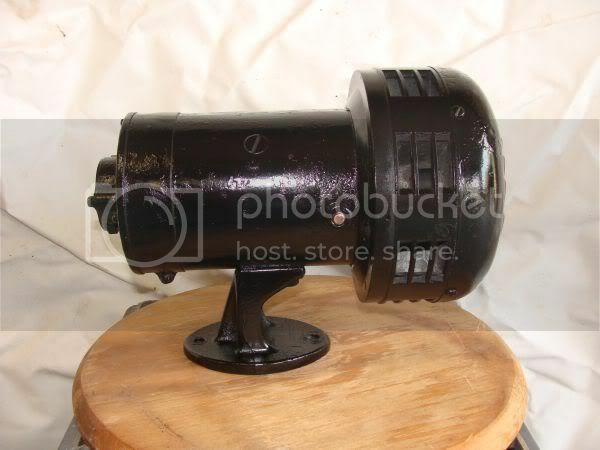 I have the opportunity to purchase this Federal Model 28 siren. I'm not hip to this part of professional cars. I know hardly anything about the lights and siren, as i mostly deal with hearses, but i am very anxious to verse myself in this aspect as well. It appears to have been crudely painted black. I assume it was probly chrome. It does work and is very LOUD. It actually doesn't look like it was a chrome siren. Those sirens (without the "bullet" on the back) were designed for under-hood mounting. As such, they were factory painted, usually black or gray. So it's not as bad as you'd think. As for price, check e-bay for recent sales of Federal Model 28 sirens. Without checking, my guess would be around $100-$150. Here's a picture from a 1949 catalog. In later years the color was changed to hammertone gray and the mount was adapted for demountable use. 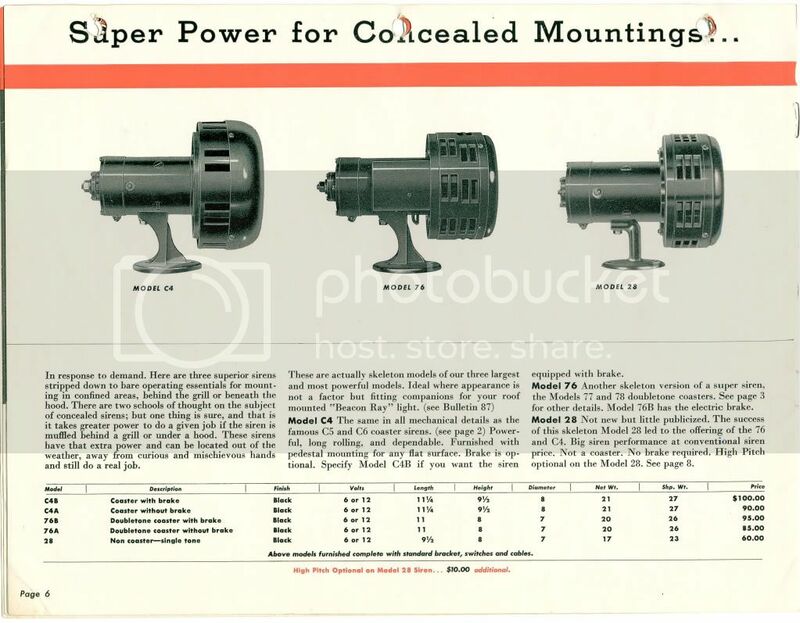 The motor is the same as is used in Federal's big-boy "Q." Steve's correct in saying that yours was not chrome-plated. While Federal's designation for yours is a Model 28, the chrome-plated version (which includes motor cover) is a Model 66. As Steve said, they were popular for underhood applications; however, FDNY used a potful of them roof- and bumper-mounted in the '60's/'70's. Steve is also correct in his value assessment. You might consider having a motor-repair expert assess its internals before purchase. Thanks guys, and to those that sent me PM's, for all the great info. I'm working out a price as we speak, might go pick it up this evening. Now, would anyone care to try and tell a complete NEW-BIE how one would wire one of these bad boys? The nut/bolt protruding from the motor is the positive lead. Use 4-gauge (sometimes called "No. 4" or "battery") cable with appropriate ring connector. Unit is grounded when mounted to the vehicle, assuming it's mounted to a metal surface, which is mounted to a metal surface, etc. Fuse appropriately. If testing with a power source other than a vehicle (battery charger or such), attach the positive lead to the aforementioned nut/bolt & secure the negative lead to the siren's base. Ensure the siren is secure before applying power, and keep fingers away from the rotor. Ok. Thank you. Seems straight forward. So the siren is grounded by its houseing, and power is applied by the pole on the side. Now will i require a solenoid for this set up? If not, what would i look for as a switch? Like a push button? I assume it will need to be capable of a certain amount of amps. Sorry I forgot to mention the solenoid. The answer is "yes." Can't remember the amp-draw on the 28. Anyone? I prefer a momentary-contact foot-operated switch. 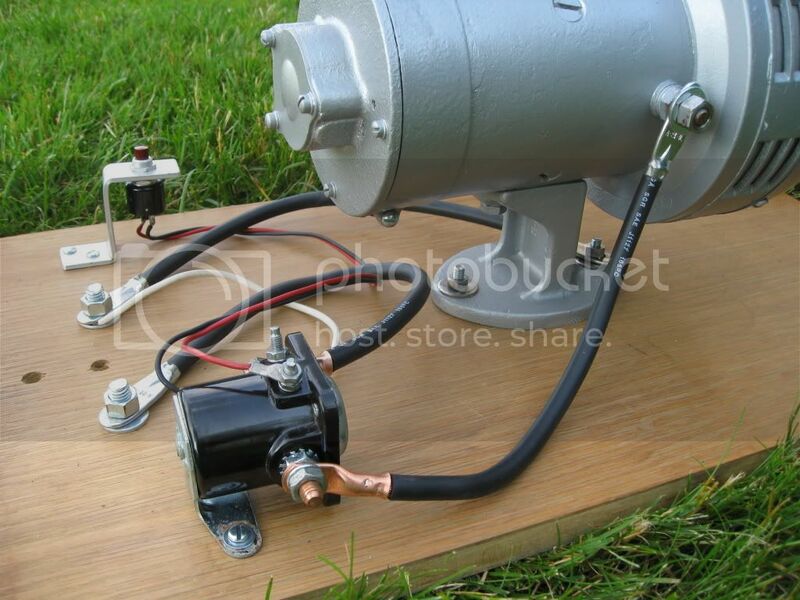 www.colehersee.com can help with the solenoid & switch. Forgot about this picture provided by a kind soul on another board. 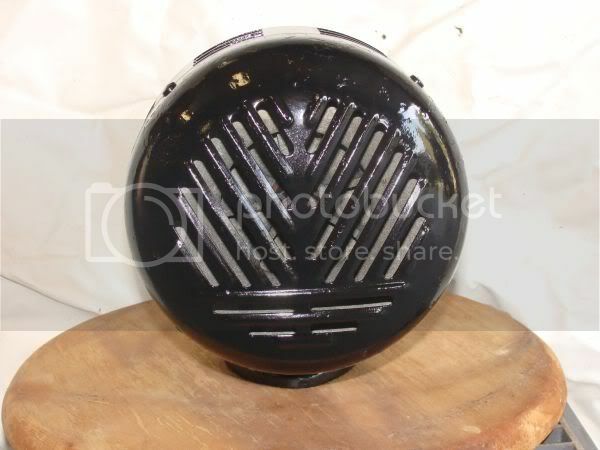 Paul, Rust-O-Leum makes a hammertone silver paint that comes very close to matching the original color of this model. The relay in the picture looks like the starter realy on my 65 Ford Galaxie. Around $20 at most auto parts stores. Used to be 6 bucks but times have changed. Since the motor on the siren is pretty much a starter motor a Ford realy should work. Thanks Mike! Thats good to know. I have some ford starter solenoids laying around, so i should be in business! Thanks again so much for the info guys. Nice to have a resource like this to make an informed decision to purchase something somewhat obscure. Thanks again!